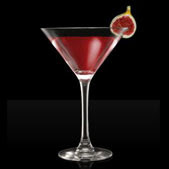 The Restaurant Week is one of the most important gastronomic events in the world. It came up 17 years ago in New York and nowadays is already in more than 100 cities in various countries. São Paulo is internationally recognized for its cuisine and hosts excellent restaurants where it's possible to enjoy the best of the international cuisine. The Restaurant Week, held from August 31st to September 13th, will show it through this 5th edition that arrives promising to overcome the most positive expectations. As never before, 202 restaurants have accepted the challenge of creating special menus for popular prices. The menus are composed by entrance, main menu and dessert with a unique price in all the restaurants: R$ 27,50 for lunch and R$ 39 for dinner. But these prices don't include beverage and/or artistic coverts. This year, in honor of the French Year in Brazil, some of the restaurants prepared dishes of various nationalities with French inspiration. The objective of SPRW is to let accessible the high level cuisine to everyone. Aiming to help a Brazilian Children Foundation (Fundaçao Açao Criança) all the menus will have an increasing of R$ 1 for this cause. Visit the restaurants during the event is a great opportunity to meet some of the most outstanding restaurants in the city and contribute socially. Check it out as much as you can anyone of those 202 restaurants in town. 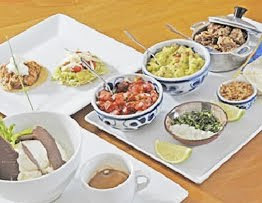 São Paulo is one of the biggest Gastronomic Capitals in World. Don't miss it! When: August 31st to September 13th. Lunch and Dinner. Where: Click here to follow the program. There are 202 restaurants aiming to help you. 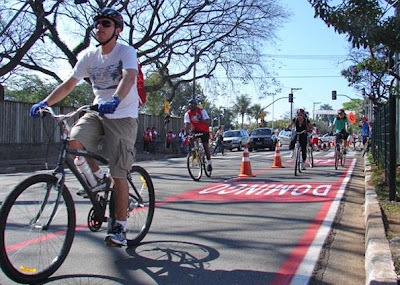 Sao Paulo has opened on August 30th the first bike lane of leisure. With 5 km long, linking: Parque da Bicicleta, Parque do Ibirapuera e Parque do Povo on the south region. The bicycle lane is painted in red and the path has vertical signs and banners for education and guidance for drivers. The lanes leisure work only on Sundays, from 7am to 12pm and is an experimental project of the Municipal Council. The secretary of Sports aims to create over than 22 kilometers of lanes in the city in nine areas of leisure. However, it can be much higher. Some sub-prefects interested on this project, offered new areas for the lanes to reach their regions. The locations are not confirmed. Among the regions that could gain a lane is the Center. According to the department, 700 thousand people use bicycles on weekends, and 4 million not do so for lack of adequate space. Da Quina Bar is a two store building made for those who are looking for a place to have a beer and meet some friends. It's perfect to watch soccer games because they provide TVs during alive games via pay-per-view. Inside the bar, it's possible to watch more than 4 different games at the same time, having beer while eat some of their great dishes. My suggestion is anyone of the dishes served on the grill. 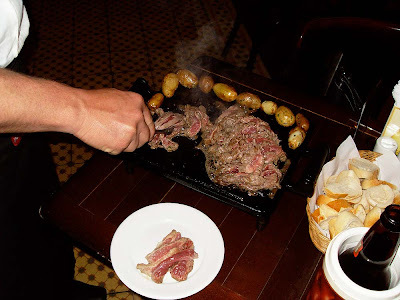 As you could see on the picture above, I tried the 'Fraudinha na chapa' (Skirt Steak cut on the Grill) and I recommend. There is also the famous 'Picanha' among the options. The best of it is that you can be the chef. The waiter brings the grill and the raw and seasoned slice of meat. After that, he just set it on fire and you are responsible for the rest. Uncooked or Overcooked? It's up to you! Perfect to have some fun with your friends while preparing a Barbecue inside a bar. Each dish serves 3 people. The menu offers also Salads, Snacks and Sandwiches (try out the one with Carpaccio). 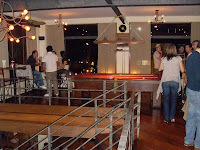 Upstairs there is a nice billiard pool where it's possible to play for an hour or half (R$ 20 or R$ 15). Among the deals — during the week —, from 6pm to 8h30pm one bottle bough becomes two, Whiskey and Cachaça get 20% off and girls can buy one Caipirinha and have two. There is alive music every Thursday and Saturday. It's a great place to be. When: Monday to Friday, from 5pm till 1am. Saturday and Sunday, from 12pm till 1am. I love Sao Paulo but there is one thing that could be improved and it's the offer of good Hostels or Guesthouses. In fact the city has a lot of good Hotels but not many of them. Maybe because the plenty of business events/tourism and not so much back packing tourists, but I think this can be an explication as well as a consequence. Young people love cosmopolitan cities like Sao Paulo and I think that if the offer of hostel could improve, this would help to raise this kind of tourism too. So one thing you do when you plan a trip with your backpack is to visit the worldwide famous site hostelworld and look for a place to stay. Despite the number of hostels in Sao Paulo is quite few — especially compared to other Brazilian cities —, there is one that is really special. The customers of this site, in fact, elected the Vila Madalena Hostel as the best in Brazil in 2009! So it really is a good choice if you wanna spend some days in 'Sampa' or you wanna invite some friends but you don't have space at home. This hostel has a creative atmosphere because it hosts exhibition of young artists and designers. They offer both private and shared room, so it is good even if you are a couple and the best thing is the position. It is located 2 blocks from Benedito Calixto Market, it is few minutes walking from shops, cool bars and metro station and you can also rent a bike to discover the city! How much: R$ 110 for a private room, R$ 45 for a 4 people shared room and R$ 40 for a 8 people shared room. Telephone cards are sold in several commercial shops, such as bars, bakeries and newsstands. 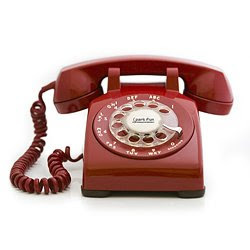 For calls outside São Paulo, dial zero + operator number + city code before the telephone number using a fix telephone. For international calls, dial zero + operator number + country code + city code before the telephone number using both a landline and mobile telephone. City code of São Paulo is 11. In order to call some cities using the same code, dialing operator number is required. Entering the ground floor of the Casa Bola — home of the architect Edward Long —, an exciting electronic experience is available at the tip of your fingertips. SuperUber combines a creative atelie with a technology lab and its unique design style, to create multimedia and interactive projects for culture, education, entertainment and advertising. The company has created the first multi-touch table in Brazil, and has participated in exhibitions and festivals throughout the world such as: PeléStation at World Cup 2006 Germany | Spring Dance in Holland | Cognizance in India | Open Air in Portugal | Portuguese Language Museum, Claro Cine and Tim Festival in Brazil. Don't miss it! When: August 11th to 30th, from 10am till 8pm. For those who want to know the history of Bom Retiro — neighborhood of the central region of Sao Paulo —, should go to the Museu de Energia de São Paulo (Energy Museum of Sao Paulo), where to see an exhibition of drawings and photographs. Through this exhibition is possible to see the evolution of the region with the help of immigrants from various parts of the world (late 19th century) and how these cultures lived together. In Bom Retiro the daily life of residents and visitors of the neighborhood is seen from the point of view of an unique developing community . This neighborhood is also highlighted by the fact of being located at an important location at the beginning, where the British railroad called Sao Paulo Railway was built between 1860 and 1867 and for being among the Tietê and Tamanduateí. Nowadays the neighborhood is well known for being a great polo wholesale clothing, but without leaving aside the fame of the gastronomic variety and miscellaneous cultural aspects so distinguished. Materials like wool and string lines were used by artists like Bo Tati, Gina Dinucci, Eduardo Rosa, Hugo Perucci, Fefa Brito and Vânia Medeiros to produce the artworks. 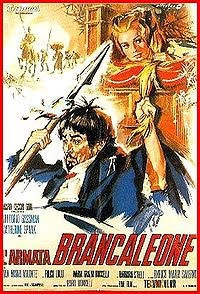 When: Friday at 7h30pm; Saturday and Sunday at 11am, 5pm and 6pm. Is already happening on Ibirapuera's Park, the exhibition "Cérebro: o Mundo Dentro da Sua Cabeça" Brain: The World Inside Your Head. It's on the Arts Biennial gallery. The exhibition addresses issues related to the brain functioning, such as chemistry and neurons, dreams, language development and neurological diseases. Videos, explanatory texts, expository content, interactive elements helps to explain human and animal brains. One of these platforms shows a trick mirror that gives the visitor the feeling of having an imaginary arm. Another reproduces the reflex we have when we touch a hot plate. 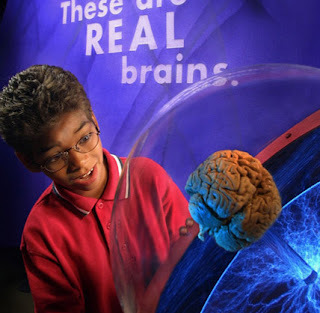 The exhibition - developed by the American Institute National Institutes of Health, The Society for Neuroscience and The Dana Alliance for Brain Initiatives - was seen by more than 3 million people in the U.S. and Mexico. Where: Parque do Ibirapuera at Gate 3. When: August 7th to October 26th, from 9am till 9pm. How Much: From R$ 20 to R$ 40. The Shopping Eldorado's car park will turn an unusual racetrack on August 23rd. The first edition of X Race organized by Rexona Energizing put side by side supermarket trolleys adapted to get the structure of engine karts. 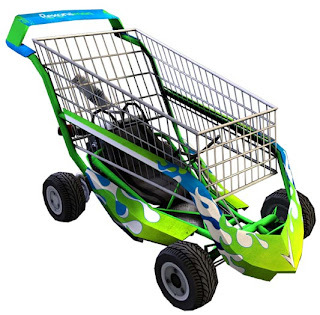 The trolleys are made especially for the race, reaching speeds of up to 70 km per hour. The cars were turbocharged with a 200 cc and 6.5 horsepower, and rear-wheel drive. 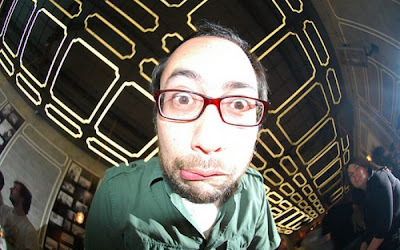 skateboarder Sandro Dias (Mineirinho), 5 times world champion, will be the special guest at the race. When: August 23rd. At 8am opens the grid and the race starts at 1pm. Way to the city: 25 kilometers far from São Paulo downtown and it has common bus service (phone: 156) and special bus service, by EMTU (Airport Service) – Telephone: (11) 2221-0244. 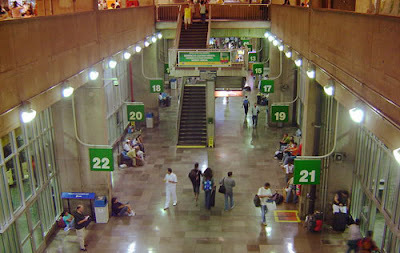 Way to the city: It is the airport with the highest movement in South America. Only eight kilometers far from downtown and has a bus system to the city and a special service by EMTU (Airport Service) – Phone: (11) 2221-0244. Way to the city: 18 kilometers far from Campinas downtown and 99 km far from São Paulo Viracopos airport can be reached by Santos Dumont road. There is daily bus connection between Viracopos and Congonhas and Cumbica airports. For further information, phone (19) 3234-1000 and (19) 3234-5505. Way to the city: Airport is exclusively used for executive aviation, air taxis and pilot schools as the São Paulo and the Aerial Tactics for the Civil and Military Police; Located in the Northern area of São Paulo. 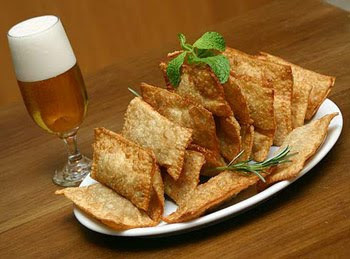 Pastel and Chopp is something you have to try! The City Council is considering the possibility of creating a competition to choose the best street Pastel of the city. The initiative was announced by the Sub prefectures Coordinator, Andrea Matarazzo, on his Twitter page. "First we'll select the best by region (five) and then come the grand final" he said. The beginning of the competition and the rules haven't been defined yet. Inside São Paulo will be up to date on it! In a single night, the wistful, curious and lovers of Spanish culture can be delighted with the two main export products of Spain: Flamenco and Paella (P.S. : it doesn't matter which one comes first). Incidentally, all together at the same time. On stage: Fernando de la Rua on guitar, Márcio Bonefón on vocals and Yara Castro, Priscila Assi and Miguel Alonso in ballet. The dish: a delicious and hearty Pepe's paella Valenciana, served fresh and following the Spanish traditions. Make reservations because it pumps! When: August 21st to 22nd at 10pm. How much: R$ 12 [Paella: R$ 22 per person]. The City Council is already expecting company's bids for providing wireless Internet signal in the Ibirapuera Park. The best price of the full service (that includes installation of the broadcaster antenna on the Park's Veranda and host system) will get it. The bidding runs until the August 28th. 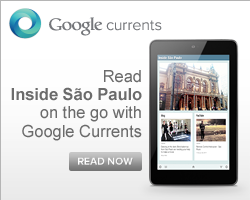 Nowadays, only the Centro Cultural São Paulo offers free wi-fi signal in the city (limit of 140 devices). Together with Ibirapuera Park, the wireless Internet will be also provided on the parks Chico Mendes and Raul Seixas, both in the east, and the Aclimação. Access will be free for registered users. Film Baba by Zuzana Kirchnerová-Špidlová, Czech Republic, 2008. To celebrate the 20th anniversary of the fall of the Berlin Wall, the programming of the 20th Short Kinoforum is a selection of the latest domestic and international short subject movies and it will have an important participation of German short subject in both the International Exhibition, and in Special Programs with the show "Querida Teletransportamos o muro" (darling we've teletransport the wall) and the "Panorama do Curta Alemão" (Overview of the German Short Subject). The exhibition "Querida Teletransportamos o muro" presents 6 short films on the Berlin Wall and the border between West and East Germany, providing an outlook on life before, during and after the Fall of the Wall. "Panorama do Curta Alemão" also brings 6 short films and seeks to highlight the continuing importance and quality of walking in Germany, emphasizing the experimental and documentary areas. Axel Behrens, representative of KurzFilmAgentur Hamburg e.V. (Agency of the Hamburg Short Subject Film) and member of the International Short Film Festival jury in Hamburg, is the curator and will be present at the Festival. Where: On different places. Have a look on the Program by Schedule in English. When: August 20th to 28th 2009, opened from midday till 8pm. That is the largest international event for technology in concrete's construction in Latin America. It follows the global organization trend of professional events targeted to this audience. Concrete Show South America is an international meeting point of business and technologies exclusive for concrete supply chain and its users. The show will be attended by thousands of construction professional from all over the world gathering in Sao Paulo to do business. This year Concrete Show South America promises to bring you an even bigger and better show with the best and new technologies in machinery, equipment, commercial construction products, services and constructive systems from leading industry suppliers. 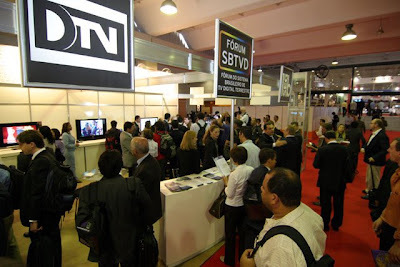 The industry of film and audiovisual organize its fourth meeting in 2009 divided into 3 sections: Exhibition, Seminar and Audiovisual Content Market with business meetings and co-production chats. Organization: Certame Display Montagens e Locação de Equipamentos S/C Ltda. When: August 26th to 26th 2009. A Broadcast & Cable is the main event of Engineering TV, Radio and Telecommunications in Latin America aimed to professionals, entrepreneurs and executives in the market of production and distribution of electronic content, multimedia, including TV and pay-TV, radio, internet, industry , manufacturing and telecommunications. When: August 26th to 28th 2009, opened from midday till 8pm. P-MEC South America - International Fair of Equipment Suppliers, Machines and Solutions for the Pharmaceutical Industry is a biennial event, held in 2009 and returned to Brazil only in 2011. It aims to provide the pharmaceutical industry an exhibition area of 12 square meters, twice higher than its first edition in 2007. When: August 26th to 28th 2009. Opened from 1pm till 8pm and 28th from 1pm till 6pm. 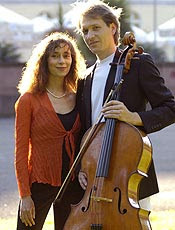 Karlsruher Konzert Duo, formed by the cellist Reinhard Armleder and the pianist Dagmar Hartmann will make a presentation on the project 'Música no Masp' (Music in Masp) this Tuesday, August 18th at 12h30pm. The dual from the city of Karlsruhe play musics of Robert Schumann, Felix Mendelssohn Bartholdy, Maurice Ravel, Manuel de Falla and Astor Piazzolla. When: August 18th at 12h30pm. 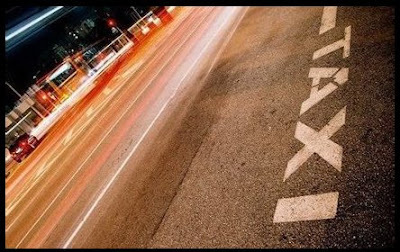 If you are in Sao Paulo and need to get a taxi cab, my tip is to get one from Coopertax. 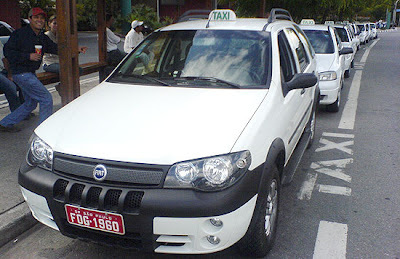 This company offers over than 400 cars in whole Sao Paulo through 52 differents spots. They are really professional and most of it's clients are companies. The place where I work for, uses it's service and they are impeccable. Recently they've installed a brand new GPS system in whole fleet and it helps the service get fast and precise. The best advice for those who doesn't speak enough Portuguese by phone, is to ask a help for some local. Unfortunately the company doesn't provide English speakers at the call center, but they have English speaker Taxi drivers. It's possible to book this service, but you'll have to ask some help. When I called them to interview about the service, they said the best way is to ask someone. They constantly get bookings from Hotels and Companies, asking for English speakers taxi drivers. It's a good tip in case you want to go to somewhere and don't know how to get back. It's possible to book a pick up service where ever you are. They will be there. When: When ever you want. It works 24/7. The next Erotika Fair is coming up on the first half of October. This 15th edition promisses to be the biggest in Latin America. 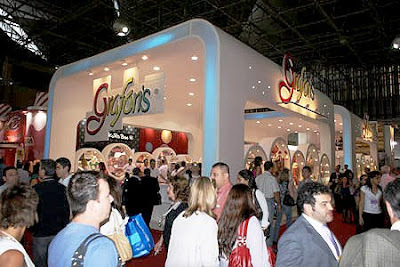 In 12 years, the event has received up to 300 thousand visitors that have seen more than 10 thousand products, plenty of hours of strip shows, workshops and sexual exhibitons. The event is booked to October 9th to 12th at MartCenter. There are more news coming up later. The AC / DC Band is coming to Brazil on November. It will be a single show in the country and São Paulo will host it! The band will be here on November 27th playing at the stage inside Morumbi Stadium. The Australian quintet presence in São Paulo is scheduled on their world tour that is promoting the last album 'Black Ice', released at the end of 2008 and the group's first album in eight years. It is the third time that AC / DC comes to Brazil. The first was on 1985, in Rock in Rio. On the last visit in 1996, they came using a huge production which included a house smashed by a demolition ball which crash few seconds before the band begins to play. In November it won't be different. The new show of Angus Young's Band begins with a cartoon. On the animation, Angus character is a devil leading a train. Some girls come to pick him up and it makes the machine run out of control and crash. As soon as the accident happens on the screen, the AC / DC is on stage and released the first chords of Rock'n'Roll Train, the opening track from Black Ice. Check it out on the video below. The band was formed in 1973. In 1980 the lead singer Bon Scott died, which had recorded with the group the classic album Highway to Hell. Aiming to replace him, Scottish Brian Johnson came up and not only assumed his position as also recorded two more classics: Back in Black and For Those About to Rock. 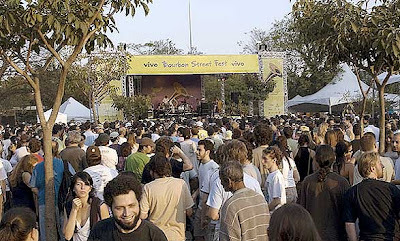 This Concert happened on August 15th at a Stage in front of the Afro Museum - Ibirapuera. Glen David Andrew and his band made a great presentation. That was a bit of New Orleans in Sao Paulo. Thanks to the Bourbon Street Fest 2009. Next Sunday (August 23rd), at Rua dos Chanés, another concert is coming up for free on the street. Leroy Jones Quintet, Sunpie & The Sunspots, Big Sam´s Funky Nation, Kurt Brunus Project, Jam Session will be there to make it happen. Check it out! Both highways connect São Paulo metropolitan area to the Port of Santos, Petrochemical Complex of Cubatão, factories and industries in the ABCD region (Santo André, São Bernardo, São Caetano do Sul and Diadema) and beaches on the Santos Coast. Connects the capital to the cities of Uberlândia and Uberaba (in the state of Minas Gerais) and Federal District, Crossing Jundiaí and close to cities like Barretos and Franca. Information on tolls on www.autoban.com.br. Access to this highway on Marginal Tietê km 22,5. Ayrton Senna highway, former Trabalhadores, connects São Paulo to Guarulhos International Airport and to Presidente Dutra and Carvalho Pinto highways to Rio de Janeiro and the Northern coast of the State of São Paulo. Carvalho Pinto highway leads to Campos do Jordão and Taubaté. Information on tolls on www.dersa.com.br/rodovias. Highway crossing the State of São Paulo leading to Carapicuíba and other cities and towns. Information on tolls on www.viaoeste.com.br. 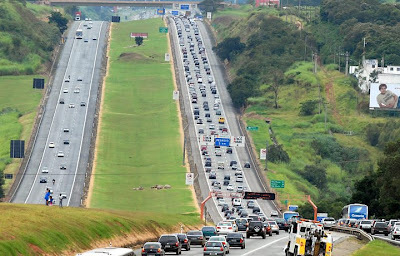 Highway connecting São Paulo to the Southern Minas Gerais and Belo Horizonte. Crossing cities like Mairiporã and Atibaia. Access to Dom Pedro II highway. Information on www.br381.com.br. Connection between São Paulo and Southern Brazil. This road is the main access to Curitiba and some cities in Greater São Paulo, such as Embu, Taboão da Serra, and others like Registro, in Southern state.